Clear skies. Low 39F. Winds NW at 15 to 25 mph..
Clear skies. Low 39F. Winds NW at 15 to 25 mph. Photo from the book, “A Hard Road To Glory”, written by Arthur Ashe. Joe Lillard, a graduate of Mason City High School, followed a brief stint at the University of Oregon with a career in professional football. MASON CITY — Joe Lillard, possibly the best all-around athlete Mason City ever produced, was the son of an Oklahoma coal miner and a housekeeper. A 1927 graduate of Mason City High School, Lillard played professional baseball and football and was an original member of the basketball team that eventually became known as the Harlem Globetrotters. Now a new generation is learning of his accomplishments because of an article in a national magazine and a display at the Mason City Public Library. 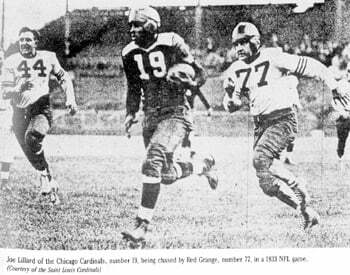 "Joe could do it all — punt, pass and run," fellow National Football League player Ray Kemp said in 1933. "He did it all with great abandonment." Born June 15, 1905, in Tulsa, Okla., Lillard came to Mason City in 1915, following the death of his parents. He was adopted by a Mrs. Walter White, but during high school lived with two relatives, Herbert and Horace Spencer, brothers who owned a sidewalk paving company in Mason City. At Mason City, Lillard was a two-time all-stater in basketball, playing center, and in football, for which he played halfback and, later, quarterback. He was all-state tournament center in basketball in 1923. In football, he thrilled fans with a 90-yard touchdown run against Fort Dodge in 1923, and in 1924, in a game against Des Moines Roosevelt, with a 100-yard punt. Lillard was also a state track champion in the high jump, long jump, shot put, discus throw and was lead-off man in the mile relay. One of his teammates on the 1925 track team was George Baird, older brother of puppeteer Bil Baird. After high school, Lillard briefly attended the University of Oregon, where he starred in various sports. He is still considered one of the best football players ever to play for the school. Lillard, who died in 1978, was featured in an extensive article by Daniel Coyle published in the Dec. 15, 2003, "Sports Illustrated." The article, "Invisible Men," brought to light the impressive accomplishments of little-known black football players. On Oct. 13, 1935, in New York City, the New York Brown Bombers, a semi-pro football team featuring star player Joe Lillard, played the all-white Cagle All-Stars — and won, 28 to 6, Coyle wrote. The game was organized after NFL owners stopped hiring black players in 1934. Since the NFL's founding in 1920, the league had been integrated. It was segregated in 1934, during the Depression, because of complaints from white players about the lack of jobs, according to "A High Road to Glory," a book by tennis star Arthur Ashe, published in 1988. The Brown Bombers, who played the top minor league and independent teams of the day, helped lay the groundwork for the reintegration of the NFL. The 6-foot-1, 185-pound Lillard was also known for fighting and ejections, usually after tauntings by white players on opposing teams, Coyle said. One of about 12 blacks to play in the NFL, Lillard had previously played for the Chicago Cardinals in 1932 and 1933, where he was nicknamed "the Midnight Express." He then played for the semi-pro Westwood Cubs of Los Angeles. He was playing for the Cubs when he was recruited for the Brown Bombers. Lillard continued to play for the team for three seasons. The team broke up in 1938. Lillard went on to play for various minor league football teams. In 1939, he became the first black player to be elected captain of a major mixed-race pro team, the Union City Rams of the American Pro Football Association. Lillard last visited Mason City in 1958, when he was working as assistant manager of a television appliance store in Queens, N.Y. In 1998, Lillard was named a Mason City High School Distinguished Alumni, the school's highest honor.